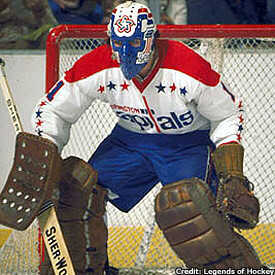 Ron Low was in goal for the Capitals when they snapped their 37-game road losing streak on Mar. 28, 1975. Somewhere in the San Francisco Bay Area, there might be an old garbage can that features the signatures of members of the 1974-75 Washington Capitals. If that garbage can still exists, it is a reminder of the end of the longest road losing streak in NHL history at that time. The Caps beat the California Golden Seals, 5-3, in Oakland on March 28, 1975 to snap a 37-game road losing streak. It was the first road victory for the expansion Caps and their only road win that season. By all accounts, it was a forgettable season. The Caps lost 17-straight contests, which broke the record set by the Philadelphia Quakers in 1930-31. Defenseman Bill Mikkelson finished the season with a plus/minus of minus-82. The Caps scored just 181 goals in 80 games and allowed 446. Washington finished with eight wins, 67 losses, five ties and 21 points, nine less than the 1972-73 expansion New York Islanders. The Caps and the Kansas City Scouts each selected 24 players in the June 12, 1974 expansion draft. The Scouts got the edge in drafting, finishing the 1974-75 season with 42 points. Yes, the Capitals certainly have come a long way, now able to boast the likes of star forward Alex Ovechkin and some impressive young players like Nicklas Backstrom and Mike Green. Ron Low, who had a 5.45 goals-against average that season, was in net that night in Oakland. That win was the highlight of the season for Washington, a year that started with the Caps becoming the only team in NHL history to wear white pants. After the Caps beat the Seals, Tommy Williams, who had two assists that night and was the game's second star, picked up the trash can, held it over his head and passed it around the room. The Caps paraded it around the room. After all, the Caps finally won a road game! "Yep, everybody signed it," said Low. "We made sure we got our names on the Cup and that was the end of our parade. It was bad enough that we only won seven at home. It was a pretty scary hockey club, not a whole lot of things you remember about it as great. You look at a lot of things that took place, 13 goals at Buffalo against and four of them by your own defensemen. "You could make a pretty good movie out of it." Things didn't get much better in 1975-76. The Caps rode a 25-game winless streak, but a new coach, Tommy McVie came in during midseason and made life a bit more interesting. McVie used all sorts of motivational tricks, including playing John Phillip Sousa marching music in an attempt to get the Caps to play better. "I was there for two years with Tommy. He changed the hockey club and it became respectable and it had a work ethic. Tommy did a lot of things there. He was one of the best coaches I ever had. His whole thing was if you didn't work hard in the games, then you were going to work hard around them. He did a hell of a job with a hockey team that didn’t have a whole lot of talent. "We had marching band music. I am sure he is the first guy who had music in the dressing room before a game, but his idea of music was not exactly what we wanted to listen to, but it really didn't matter to him. It was just awful stuff. I mean it was stuff from the war, band music and stuff like that. It was totally different. Tommy had different ways of making us relax. "It was pretty funny, for the guy who made you work as hard as you did, there weren't too many guys who quit on him. I learned a lot of things from Tommy. You can't let your highs get you too high or your lows get too low or you are going to be through the bottom." The trash can stayed in Oakland for a while and could be anywhere now. And Low has no idea whatever happened to those white pants.